You want to know why? Probably because somebody skipped the salt. Listen to me: if you want to eat healthy, stop baking cookies. Salt is a flavor enhancer. It’s just as important to sweet dishes as it is to savory ones. Maybe more so since most savory dishes have herbs or spices to help develop the flavor. And you’re all thinking about sodium now and some of you are shaking your head at me but here’s the thing… if one teaspoon of salt in whole batch of cookies is going to be harmful to you, you might ought to skip the cookies anyway. Go eat an apple and stop ruining the cookies. What brought this rant on (and you’ll have to forgive me for ranting like this… I, um… well, I’ve never gone off the deep end here before… so… yeah, errrr… sorry about that) is that I was reading the recipe for some chocolate chips cookies that are wildly popular on Pinterest right now and noticed that the recipe calls for a lot of salt. Hmmm… pinners claim recipe is the best they've ever made… recipe calls for ton of salt. Coincidence? I think not. But since I haven’t tested that recipe yet, I will post my mostest favoritest cookie recipe in the history of EVER because, really, you can’t beat it. Bake at 375 degrees for 9 to 11 minutes or until golden brown. Cool on baking sheets for 2 minutes; remove to wire racks to cool completely. I totally agree with you on the whole salt thing - makes me crazy when people leave out salt in baked goods. Personally, I can't handle people substituting crap (read margarine or lard) for butter. USE BUTTER PEOPLE!!! And......we need salt to live you can't cut it out 100% that's just insane. Agreed! Every now and again someone will tell me that the no-bake oatmeal cookies didn't turn out and my first question is, "Did you use butter or margarine?" Sometimes, if I'm feeling lucky, I'll even add ANOTHER dash of salt. I'm a rebel like that. Anyone who would say or think to write "Hells yeah, hookers, I’m about to get my EAT on" is probably one of the bestest people I'll ever meet! I'm sooooo loving your site! LOL! Thanks, I'm loving yours too! I thought the EXACT same thing, Shawn!! Me too! I'm from Vidalia Georgia, where farm folk know how to cook and eat. I live (very happily) in Atlanta now but sorely miss what I call "family reunion food"; I also miss the sass of real rural Southern women. I find both -- plus a lot of other great things -- on this blog. Thank you!! Love these cookies! My only variation is I use 1 heaping cup brown sugar and a half cup of white sugar-people go crazy for them. I agree, I can't stand it when people skip the salt !! Best blog ever! My kids keep looking at me like I'm a lunatic over here giggling and snorting. Cookies made with baking soda will spread out. 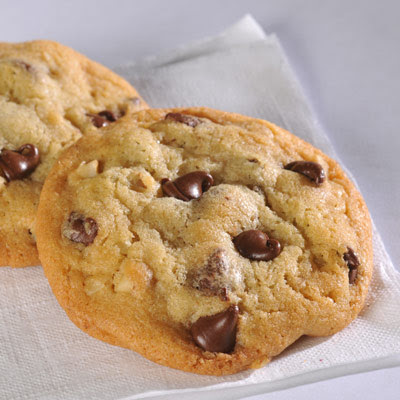 Add baking powder instead of the baking soda and you will see your cookies stand up better. Also, you should bake your cookies on a Doughmaker cookie sheet; they are the absolute best for cookies. Keep them clean every time and don't use them on stuff that drips. Also, cookies need butter; not margarine, too much water; not lard, no taste; no oil, too liquidy; BUTTER and ONLY butter. for the flat cookie post: make sure the cookie dough is COLD before you put them in the oven and make sure they are a uniform size. Usually the cookies are flattening out because the fat is melting too quickly. CREAM the butter with the sugars.... Most people do NOT understand this concept. It does not mean mix them together. Creaming means to combine until they butter changes to a light color. Do this test: mix the butter and sugar the way you normally do, now take a small 1/8 tsp sample and set aside; Now turn the mixer on and keep mixing for 5 minutes, and take another small sample; Compare the two samples and you will see a color difference, and the second sample will feel less gritty. When butter and sugar are properly creamed, the sugar has punched air into to butter and it will have a light airy texture. You surely can get away with leaving out the salt - hypertensives don't need any more, but the sweet-stuff fix is the stuff of life (sort of). Use salted butter (when did that whole unsalted-butter thing come in?)... commercial chips have salt... even baking soda is SODIUM bicarbonate. So yah, feel free to omit added salt. If the cookies don't taste right, I doubt it's got anything to do with the salt content. You want knockout cookies, of just about any type? Double or even triple the vanilla (paste or extract). Now THAT's a flavor boost that won't charge anyone's blood pressure! I use the traditional Toll House recipe, but I have found that I can reduce the amount of sugar without ruining the cookies. Instead of 3/4 cup of brown sugar and 3/4 cup of white sugar, I use 1/2 cup of each. Then, maybe to make up for it, I use an entire 12-ounce bag of chocolate chips plus about 1/3 of another bag. I also add about a cup of toasted pecans, chopped. I always use butter and good, expensive vanilla (the kind you can't get at the grocery store).